Once upon a time, strange as this may seem, a public college existed that was considered a proud resource for young people aspiring to enter law enforcement. In 1966, that college was (re)named John Jay. 45 years later, there are strong indications that John Jay is abandoning its original mission. It now harbors programs hostile to police, making it . . . well, like every other college and university, rather than a rare and needed exception to that rule. The school’s influential Center on Media, Crime, and Justice once published a largely objective-seeming resource for criminal justice journalists: Crime and Justice News. But then, the inevitable happened: they got a big wad of cash from George Soros and jumped straight off the non-partisan cliff . . . The country saw a reported 4,813 arrest-related deaths between 2003 and 2009, according to new data from the Bureau of Justice Statistics (BJS). Over 60 percent of all the deaths were classified as homicides committed by law enforcement personnel, BJS found. 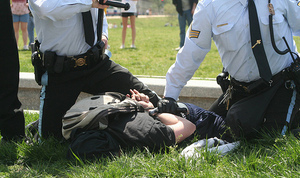 About 98 million arrests took place in the U.S. during those years. While men accounted for about 76 percent of all arrests, they made up 95 percent of the deaths. The study is part of a long-term project by BJS called the Arrest-Related Deaths program, which released its first report in 2007. Actually, do read the full report, because what you will find there is dry, statistical analysis of deaths that occurred during engagements with police, written by the BJS’s Arrest-Related Deaths program, rather than this misleading nonsense histrionically illustrated with a highly suggestive, staged photograph of two officers kneeling on some poor college kid wearing a backpack. Nor explanation of why this article is tagged “murder,” when murder is definitionally different from homicide, which is the thing the DOJ analysis is actually addressing. This is far from an isolated example of anti-police bias in the allegedly scholarly Crime Report. To summarize: Soros buys a few academics at John Jay, and they start their own “newspaper,” which disseminates misinformation in the name of a college that used to be a refuge from the usual cop-bashing fantasy-land of academia. I suppose that’s where I’d spend my money, too, if I wanted to scorch the earth and could afford to do so. And people holler endlessly about the Koch brothers funding one little economics chair in Florida. Meanwhile, the Soros and Ford Foundations — which are institutionally hostile towards policing and law enforcement — they buy entire academic departments, and the departments abandon whatever scholarly objectivity they still clung to — and nobody so much as whispers. 1 Response to "John Jay College’s Crime Report: Getting Less and Less Objective By the Day". Add a comment? or Follow comments by RSS?